Design the outdoors with this contemporary square Lounger Patio Set by CorLiving. Featured in our Textured Black Weave and accented with Dove Grey woven cushions this versatile set is perfect for all of your summer poolside lounging. Made with UV resistant resin rattan wicker, water repellent cushions and a durable steel frame this product is ready to withstand the elements of the outdoors. Relax while you stretch out or sit upright on this flexible and comfortable lounging recliner from CorLiving. The sleek lines and powder coated steel frame of the PJR-329-R create an elegant look while the ultra durable fabric surface provides ideal comfort for any outdoor patio. Expertly constructed to withstand a range of climates and is UV resistant which prevents discoloration or sun damage. Oakland 4 Pc Lounger Patio Set Design the outdoors with this contemporary square Lounger Patio Set by CorLiving. Featured in our Textured Black Weave and accented with Dove Grey woven cushions this versatile set is perfect for all of your summer poolside lounging. 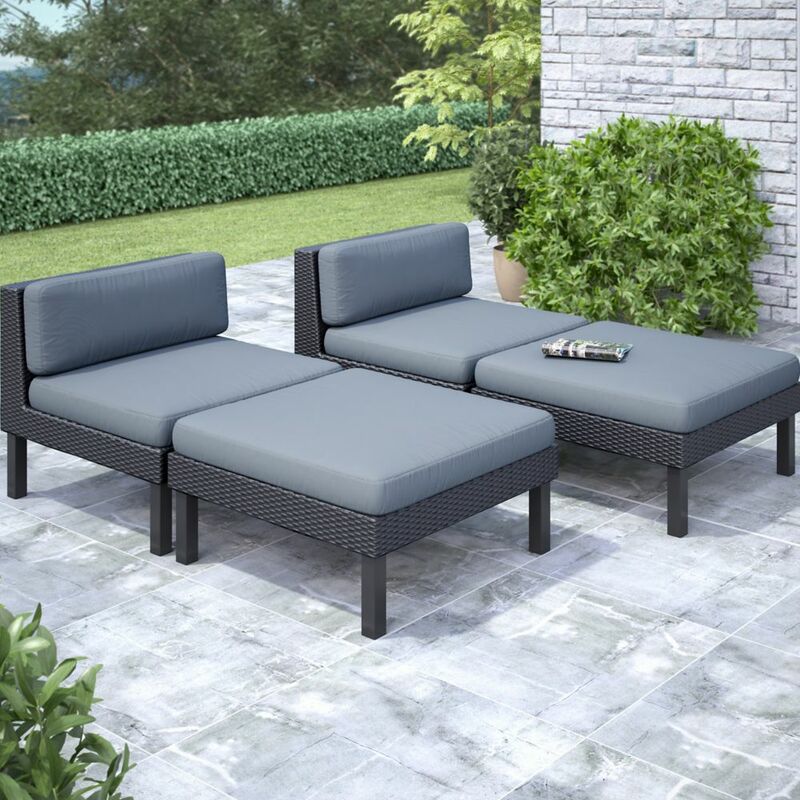 Made with UV resistant resin rattan wicker, water repellent cushions and a durable steel frame this product is ready to withstand the elements of the outdoors. Oakland 4 Pc Lounger Patio Set is rated 5.0 out of 5 by 1. Rated 5 out of 5 by Susie K from Practicle, low profile and pretty On my own it did take me a couple of hours to put those legs on, but hey, that's nothing. This set is just what we were looking for. NOT wobbly, NOT cramped for elbow room, NOT too quaint. Room for folks to find a seat, rest a tray of drinks/snacks on, lounge away. Having to set up a patio in November has been interesting. Nice to have a comfy set to pile blankets. Drink wine. Enjoy the heaters. Watch the rain.